the waitress hid for 15-20 minutes until we went away. Appalling! Went many years ago, and I had no good memory. I came back and I've found it really good. The look is typical of the "estaminet", warm, friendly and elegant. The selection of belgian beer is great (but the "Vieux Temps" smells not so good, specially if you compare it with the fabolous other belgian beers). It's worth a visit! As usual, Lad Newton's spot-on. 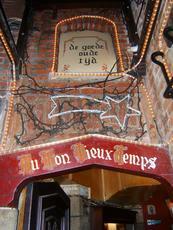 This pub is fantastic and needs a visit on any trip to Brussels. Thanks to the Germans there's not a lot of historic places left in Brussels, but this is a rare gem that needs to be seen. 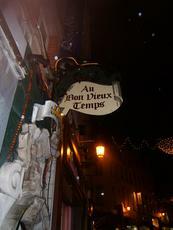 I visited this treasure of a pub on the evening of November 29th during a daytrip to Brussels. 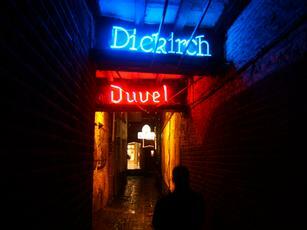 Only a small projecting sign directs you to the pub from the main road via a narrow alleyway. First-time visitors to Ye Old Mitre in Holborn will recall a similar experience. And this does not apply only to its location, but also its interior. 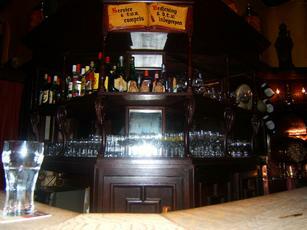 Unspoilt, centuries-old, intricate wood panelling and stained glass windows surround an L shaped bar. Partitioning creates three distinct drinking areas. Little daylight enters the pub and illumination is afforded by tungsten chandeliers. 1970s MOR and film-related background music, some interesting tracks generated conversations among those sitting at the bar. Dry, light-hopped and thirst quenching blond lager. Brown, trappist beer, solid, malty, full-flavoured and very satisfying mouthfeel. Ideal on a cold wet November evening. The landlady was very friendly and allowed me to take photographs in the pub, whilst a knowledge of French went a long way in maintaining conversation with the regulars about the beer and music. I will certainly go again when next in Brussels. Amazing to return here, feels like coming home. Good beer list and the litre draught glasses are good for when you want a nice light lager after all those 12% trappists!